Filter strings of pattern LNN_NNNN_NN_LL (L – Letter, N – Number) from a list Eg: Z00_0002_01_AA, Z01_0015_02_AA etc. Used SAP regular expressions (REGEX) concept to get this done in a program. It makes string, integer and special character comparisons much simpler. 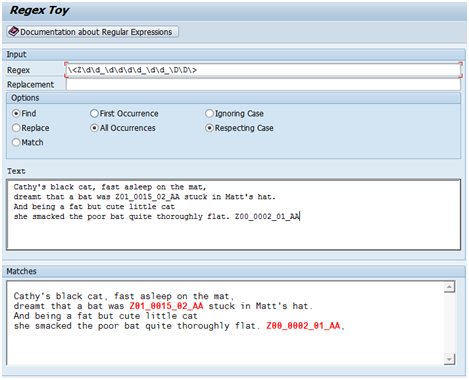 '\<Z\d\d_\d\d\d\d_\d\d_\D\D\>' is the matching pattern in terms of regular expressions for a string like ‘Z00_0002_01_AA’. DATA: c_pattern TYPE string VALUE '\<Z\d\d_\d\d\d\d_\d\d_\D\D\>'. 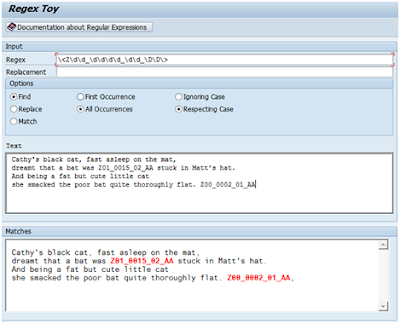 lr_matcher TYPE REF TO cl_abap_matcher. If lv_match = ‘X’ then it is a match. 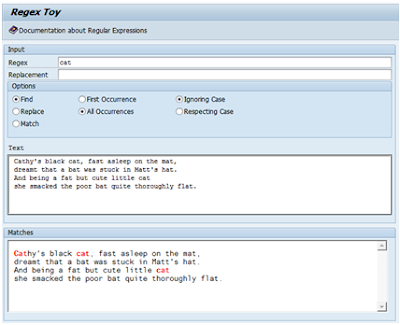 There is a standard program available to check REGEX Functionality DEMO_REGEX_TOY. Below are few screens from the same. · Expertise in enhancing the load runner scripts using parameterization, correlation, error handling. · Extensively worked on web HTTP/html, Web services ,DLL testing with VSTS and DB Testing with ODBC Protocols. · Experience in quality analysis with end to end deliverables including gathering the requirements and analysis, Test Planning, Script Creation, and Scenario Setup, monitoring Hardware as well as Software metrics, Analysis and Report preparations. · Experience in developing the Web application’s using Asp.net, Windows Application using C# language. · Experience in developing a store procedure using SQL Server 2008 and 2012. · Having Hands on Experience with visual studio 2012 IDE. Load Runner 11, VSTS 2012. Two times Bronze Award winner for good performance during the FY14 Q3 and FY15 Q14. Successfully Completed Dell Testing Certification. Designed and Developed Share point Website for tracking Application, innovation status for eDell. Designed and developed web application for booking a test slot using Asp.net and Ado.net for eDell Applications. Developed Test Data generation Tool for web service. Certified in Microsoft .Net FrameWork4.0, Web Applications Development. The GCM Cart Manager Service provides all services related to Cart in the purchase path. It is a single point of contact for invoking all core Cart related operations like managing the items of the Cart, Pricing, assigning the Shipping Method, submitting the Cart downstream for Order Processing, saving & retrieving E Quotes etc. GCM - Pipeline Service is a set of web service, web application and windows service that enables the automation of order and quote processing. Pipeline components that process synchronous online/offline quotes and sales orders. Global Authentication is the Dell Authentication Application which Take care user Authentication, Creating Account, managing account etc. The application has three main WCF Service, namely Reader service, lookup service and writer Service, which will retrieve and modify store settings from the Database. An invoice is a Windows Application which is developed as a product of Regis IT Software Solutions; Invoice Application is for industrial purpose to generate bills regarding Sales of an industry by Calculating Duties applicable over every product and total amount of bill. · Developed Front End of the application. · Involved in Database development like writing Queries, Stored procedures. · Developing project using 3-Layer architecture. ASP.Net, C#. Net, ADO.Net, SQL Server and Enterprise Library 2006.